If this setting is active, the "Details" dialog will be available that provides information about the title, type, GUID, and name of an element. Has the effect that the process will be searched for missing entries for titles in other portal languages when it is opened. This setting will show a grid on the workspace. The grid size (the distance between grid points on the workspace) can be defined here. The default value of 10 corresponds to a distance of 10 pixels between individual grid points. This setting will orient the graphical elements in the diagram view along the bars. Shows or hides the ruler on the workspace. Opens a wizard which will guide you through the first steps when you create a new process. Allows you to limit the size of the logfile, which you can view via the menu item Process / Analyze logfile. 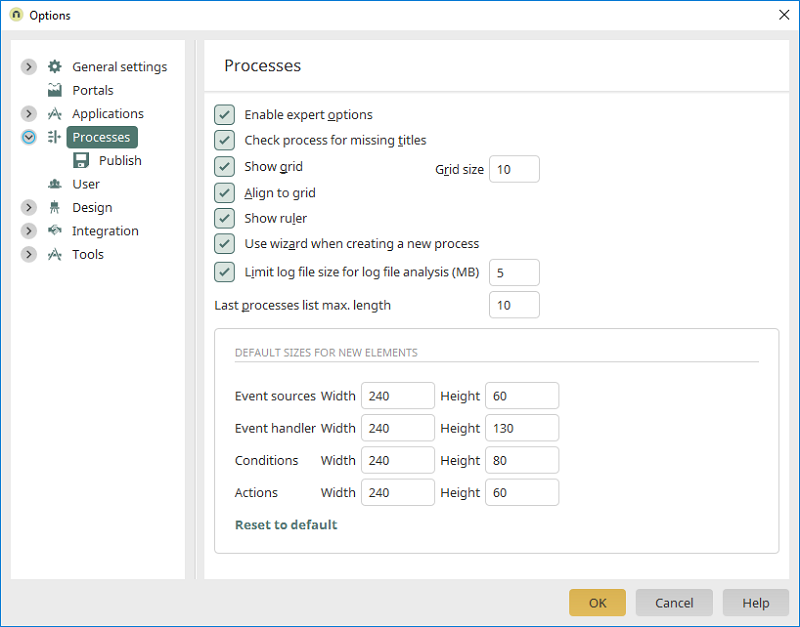 Here, you can specify how many of the most recently edited processes should be displayed in the Process Manager when "Recently edited" is clicked. In this area, the height and width of the element types event sources, event handlers, conditions and actions can be set in pixels. This size is applied to newly created elements. Resets all changed values for height and width to the defaults.